I don't have any fun stories about meeting Sir Terry Pratchett, or hearing him speak at that one place about those things that were amusing. However, I do have a story about how a beloved author wrote stories that are a not so insignificant part of my life. So I will tell that story because I think what any writer—or any creator of things for that matter—likes to hear is that their work has touched someone. Even if it's too late for these words to find their intended target, I will write them anyway. For someone whom I've never met, nor to presume to know much about personally, Sir Terry Pratchett's words have been with me for most of my life. I remember being at the public library when I was maybe eight and seeing some interesting looking books on one of the turn-style displays. They were the early editions with the heavy metal illustrations by Josh Kirby—specifically the ones for The Light Fantastic and Equal Rights. They looked like grown up books. Those witches and wizards looked MEAN, and that lady was hardly wearing anything, and there was not a single cute furry animal in sight! I was pretty sure I wasn't supposed to look at books like that. I put them back on the turn-style. Although, I always eyed them while I was sorting through which of the candy-coated Stephen Cosgrove books I wanted to check out (they knew exactly what they were doing with all those large dewy eyed illustrations). However, I always remembered those Discworld books despite my early inclination towards fluffy stories about baby animals—with ample illustrations, of course—and always looked around for them. Should I try one out? I wasn't sure. At long last, one day I did pick one up AND I even bought it with some of my very own money instead of going the library route. At the time, my infatuation with Brian Jacques' Redwall series (what can I say, it took me a while to grow out of the cute animal drama genre) had, for the most part, run its course and I was starting to expand my literary adventures into new realms. This first dip into Discworld was Small Gods. 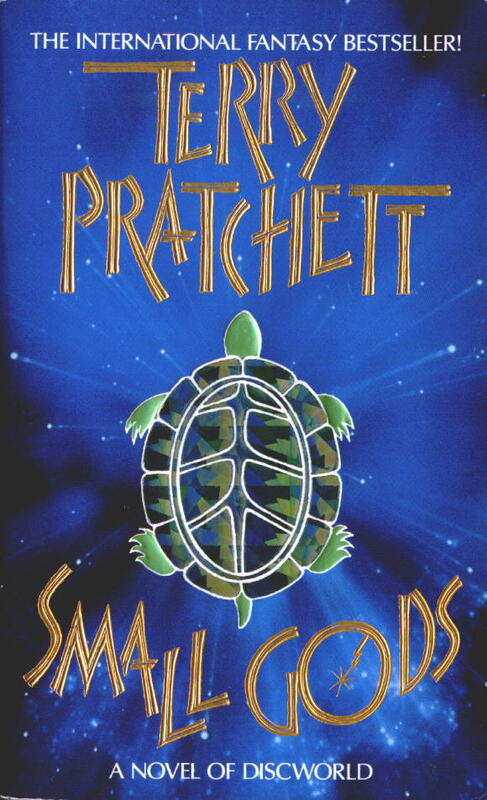 I'm now a bit embarrassed to admit the reason I picked that particular one out of all the available Discworld books was—from what I gleaned from the back-cover description—because that story involved turtles. I mean, it had a turtle on the cover and everything! Not a single scantly clad warrior lady. SCORE! I have to admit, it was at this point I was going through my turtle collecting phase, so I was predisposed to hunting down anything remotely turtle shaped. I was a teenager. I know we all went through our own "turtle collecting" phase. DON'T DENY IT. 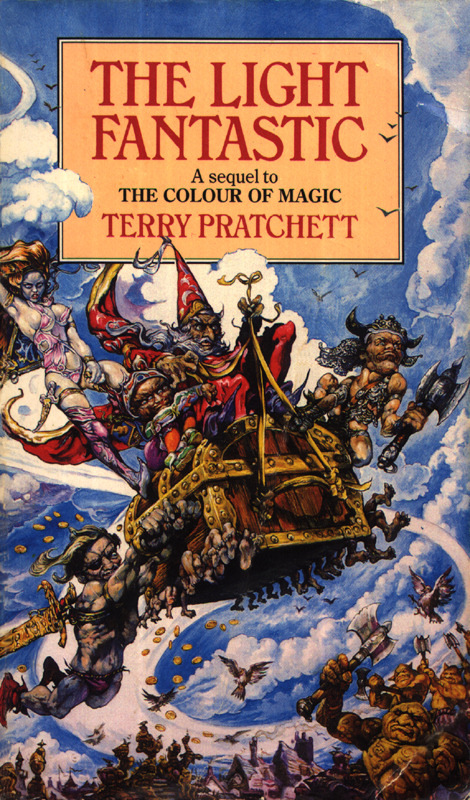 I think I was still a bit to young at the time to really understand a good chunk of the story, but there were some amusing bits, and that was enough for me to eventually pick up my second Pratchett book, Good Omensi. 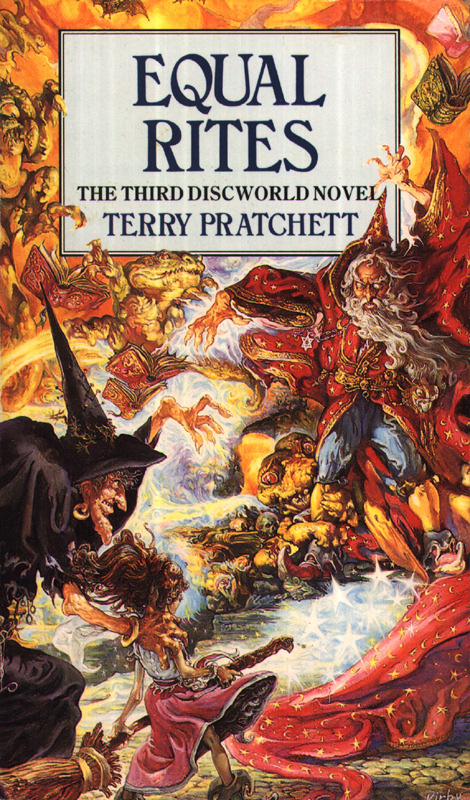 I was entranced ever since, eagerly awaiting each new Sir Terry Pratchett story over the next twenty years. There are words that have wormed their way into my speech because of these booksii. I'm fairly certain my sense of humor would not be the weird creature it is without these books. The influence in my writing—what little I do—is immeasurableiii. The Discworld illustrations of Paul Kidby have also been, and continue to be, a huge influence in my artwork. And the weirdest bit is that I didn't realize the extent of these influences until yesterday. I mean, sure, I had an inkling, like how you suspect that your exposure to Canadian children's shows at a young age is why you sometimes find yourself ending your sentences with "eh? "iv, but not the "Wow. A lot of me being me was a result of this one thing. Huh." type of realization. That was yesterday. These days, every time I visit a bookstorev, I inevitably find myself visiting the "P" areavi of the science fiction and fantasy section to look at all the Pratchett books. I have copies of most of these, yet, like calling up an old friend when you are visiting their town, or swinging by the cat adption area even though you have quite enough cats, thank you very much, I check up on the books. Sometimes it's just to see if a new one spawned when I wasn't looking (one could always hope); or perhaps I loaned a copy out to a Discworld virgin, it somehow got "lost", and I was looking for a replacement; or I was browsing that section for anything that might catch my eye, maybe something with some mean looking witches on the cover. Mostly, I think, it's because I've grown up with these stories and continue to grow with these stories; I just want to make sure they're still there, waiting for someone else to discover the delights contained within. I'm fairly certain I will continue to check up on my old friends whenever the opportunity arises. I've fallen a few books behind over the years (needless to say, a result of my interests becoming slightly more diverse than those of my cuddly-critter obsessed younger self). The enjoyment of my backlog will be even more special. Currently I'm in the middle of reading Snuff. There has been a lot of poop induced giggling by Young Sam so far and some goodhearted meddling by the good Sir Commander Vimes. It's going to be interesting finishing this one. And to work through my queue. Thank you Sir Terry Pratchett for writing all those words. I hope you find something nice on the other side of the black desert under the endless night... like some delicious tea and cake. Words, especially good ones, take a long time to fade. I suspect his words will be floating around for a good long time. i And Neil Gaiman, of course, but that is another story for another time. iii And my addiction to footnotes. v Despite any terrible rumors to the contrary you my have heard, they do still exist thanks to generous conservation efforts. They are shy though, so it's best to approach calmly and with a few biscuits handy, just in case.